Looking for a new running trail? CA89 associate (marathoner and triathlete) Cortney Hadley shares her favorite trails around north Lake Tahoe. Start/Finish: Dirt parking lot just to the West of Sugar Bowl Road. This run is best accessed via the gravel/dirt parking lot across the street from Donner Ski Ranch which is located just west of Donner Summit along Old Highway 40 (aka Donner Pass Road) and just past Sugar Bowl Road. In fact, once you park and head to the trail, you actually travel under Sugar Bowl Road. As an alternative, you can parallel park on Sugar Bowl Road and clamber a short distance down the hillside to the trail. Once you pass under Sugar Bowl Road, you immediately come upon the entrance of the first train tunnel. This is right about the point when you realize that you really do need a headlamp and it better be a good one. Once you emerge from the first tunnel, you’ll continue out in the open for about a tenth of a mile and then quickly enter a shorter, more “structured” tunnel. As always, don't forget to look up. The ceilings of these tunnels are pretty fantastic and beautifully marked by the water that seeps through and trickles to the floor. The tunnels aren’t the only visual treat on this run. Each break in the tunnels affords the breathtaking views and picturesque scenery that we’re surrounded by up in the Sierras. The last tunnel has massive rollup doors - some of which are missing. These openings provide for great access to the exteriors of the tunnels and some incredible views of Donner Lake and beyond. These tunnels have some very interesting historical significance and background. Let’s just say that they very well could be haunted. This run is a short and sweet 4 mile loop, but there are several options to increase mileage with different routes. 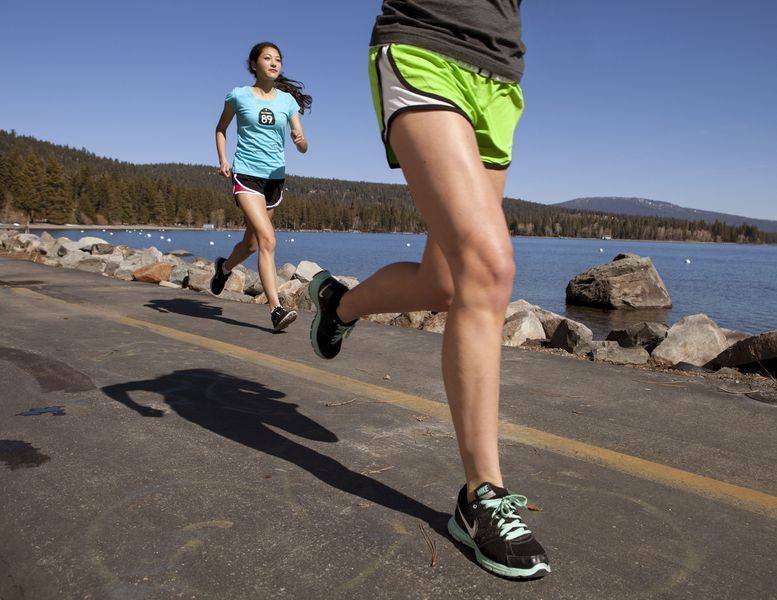 Much like all of our local running venues, Martis Valley doesn’t disappoint in terms of scenery and provides beautiful backdrops for many outdoor adventures.The run begins at the parking lot just off of Highway 267. The loop is very well marked with clear signage leading the way. About a mile into the run, the valley can tend to be a bit marshy at certain ties of the year. Fortunately, there are boardwalks scattered throughout this portion of the trail to keep feet out of the mud. Just over halfway through the route, you’ll see glimpses of a stream and foliage lining the banks which is more lush than our typical Sierra forest. This run makes for a nice summer afternoon run. The trail begins on a dirt path that parallels Alder Creek Road and eventually intersects with pavement. Once onto the dirt fire road, you’ll have an amazing ridge line overlook to the valley. This entire valley is a visual treat! The first stream crossing is at about 1.4 miles, and the trail continues on a single track trail amongst large pines, huge granite boulders and all the Sierra foliage you could imagine. Once you get to about 2.7 miles, you’ll cross another stream over a bridge composed of corrugated culvert pipe. The course loops back at about 3.8 miles to some single-track switch backs all the way back to the start. The scenic single-track trail known as Sagehen Creek begins on a lush, green wildflower splashed dirt trail. The first two miles you'll run alongside the babbling creek and through the tall pines that are the signature of our little paradise. Nearing the halfway point of the run, balance beams are in place to assist in crossing over the creek, and soon after will be the turn-around point to begin the journey back. The trail is fun, fast and has plenty of rocks, roots and fallen trees to keep you on your toes. As for elevation, it’s a bit deceptive: the way out is a very gradual descent which over-inflates the ego a bit only to be deflated on the way back due to the very gradual climb. This unexpectedly beautiful trail begins and ends on the paved portion of Cold Stream Road. This is a somewhat popular trail for mountain bikers so make sure you can hear what’s going on around you and be prepared for some speedy trail companions. After a half mile of dirt fire roads, you’ll reach a junction affectionately named “JP’s Trail.” The trail is somewhat technical with rocks on the lower section so watch your footing. Until you reach the ridgeline, the views are largely filtered through pines and really nothing to write home about but when you reach at the top, there are incredible views of the valley and beyond to both the east and the west. Just before the turnaround point, you’ll cross train tracks and climb a whopping 500 feet. The return trip is sure to be quick and you’ll descend right back down the way you came. The route begins at the sign marking the fire road into the Truckee Tahoe Airport Open Space, which is only open to foot traffic. Warm up for the first 0.7 miles on a flat fire road and cross the the stream surrounded by lush meadows. At this point, break to the left and head north into Waddle Ranch via single track trail marked by fence posts on the right. Overlooking the Martis Creek Lake to the west, you’l still be in relatively flat terrain with a few little rollers. The climb begins about 1.8 miles into the course and you’ll continue on the trail until you make a right turn uphill onto Erika’s Trail which is clearly marked. This somewhat technical, rocky single track climb takes you to the summit of the run at just over 6,300 feet above sea level. The descent (in a lollypop loop) is fast and furious! The trail begins with a steep ascent up. There is no gradual introduction to the climb so you’ll pretty much hit it from the moment you step on the trail for 1.5 miles. The trail is definitely technical with lots of rocks, loose dirt and sand, not to mention steep drop offs. There is no falling asleep or zing out on this one, but you won't want to anyway. The views and scenery on this trail are stunning. After about 1.5 miles of a fantastic climb, the trail begins to level off and will enter the woods as a gateway to the 5 small lakes for which the trail is named. At this point you’ll head back down with caution, the only thing you’re looking at on the way down is the trail! Go into this run with the ambition for a challenge, this technical, rocky and intense course begins with 3.8 miles of climbing! (Named for the shape of the run on the map and not necessarily the intensity of the run) Without much relief, the course begins on a single track just across the Donner Memorial Picnic area off of Highway 89 North, through the back of Tahoe Donner and continues to climb until you reach the top of the mountain. Once you’re there, you’ll realize it was worth every foot of quad-burning up hill running. The views of Prosser and surrounding areas are breathtaking and cannot be missed! Once you’ve hit 3.8 miles, it’s all downhill from there. Although technical, the run down the mountain is quick and virtually painless. This course begins on the first turnout on the left hand side of Alder Creek once you’ve turned left off of highway 89 North. It begins on a single track trail, continues on a slightly rocky and technical course and eventually comes out on Shussing Drive in Tahoe Donner. Once you cross over Schussing, the trail continues literally along side Alder Creek. Between the three tiny bridges crossing over the creek, the sharp hair pin turns and the amazing wildflowers, you wont have a chance to be bored on this course. The course is considered moderate in difficulty and time passes quickly! The entire run takes place on the Pacific Crest Trail and consists of rolling hills and lots of single track. Look for the ponds at 0.4 miles in and 2.6 miles from the trailhead. Views of Donner Lake, Old 40 and the surrounding expanse, as well as a ton of beautiful granite along the route. Reaching the summit you’ll see nearly 360 degree views of the area.